Cook the quinoa in boiling water until little spirals form, about 15 minutes. Drain and transfer to a large bowl to cool. Once cooled, add the flour, Parmesan and a pinch of salt and pepper. Stir to combine. Then add the cilantro, scallions, egg and egg yolk. Stir again to combine. Lastly, add the cubes of cheese. Give it one more stir. Using your hands, form meatball-sized balls and place them on a rimmed baking sheet. Heat the oil in a cast iron skillet until hot. Add the sliders and cook on both sides until browned and crispy and the cheese is melting. 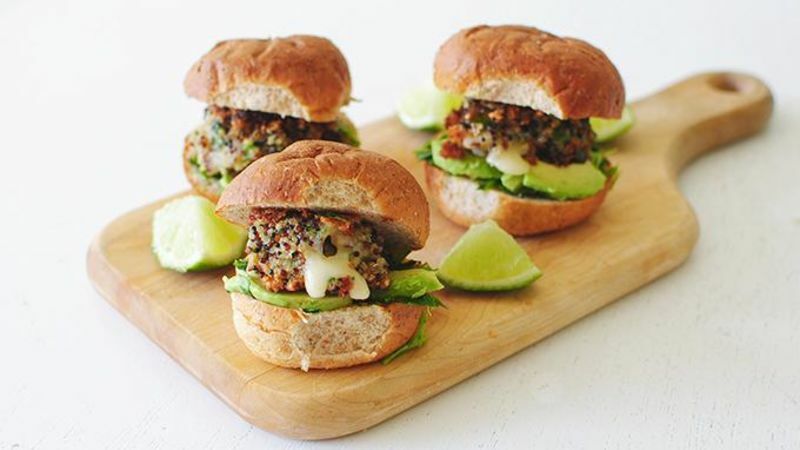 Serve on slider buns with sliced avocado and pesto sauce.